I’ve always wanted to head North to Alaska; to drive the highway again. I was in the Army and was stationed at Fort Richardson in Anchorage, arrived at my post by plane in 1963, and hitchhiked home aboard an Air Force C-130 Hercules airplane. 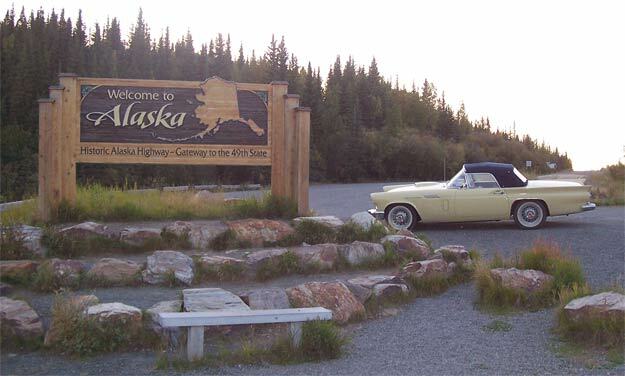 In ’64, my wife Jan and I drove a red and white ’58 Ford convertible from Tyler, Texas to Anchorage, via the Alaska Highway. I never dreamed that it would be more than forty years before I would be on this highway again. What a difference forty years makes! About five years ago, my brother-in-law Charles Hineman said he would go with me. 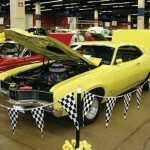 Charles and his wife Cathy (my wife’s sister) have attended T-Bird events with us. 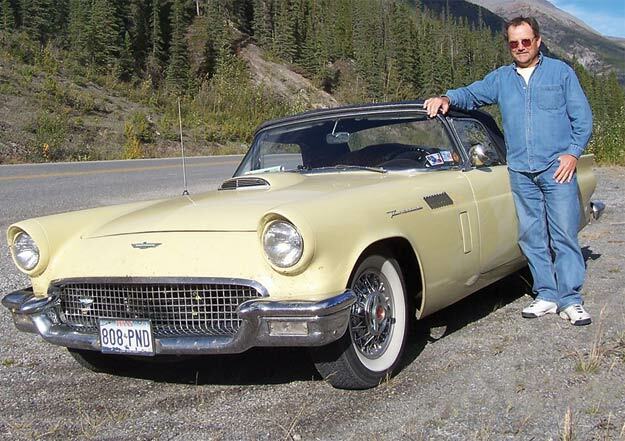 Another desire was to drive an old car on this trip, so I decided to take my Inca Gold ’57 T-Bird, an exceptionally good driver. 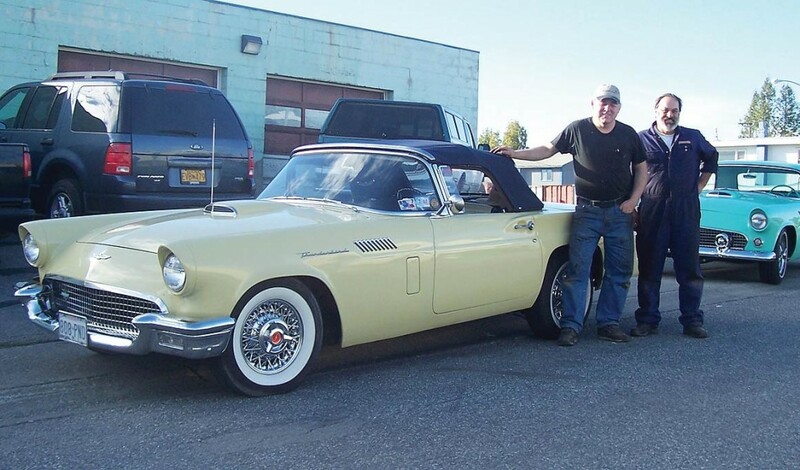 I bought this car in February of 2002 to drive during the restoration of my white ’57 ‘Bird, intending to sell it after the restoration was completed (is the story I told my wife). I worked on the brakes, suspension system (including heavy duty front sway bar, rear sway bar, and air shocks), and a new cooling system, while the motor and transmission remained untouched. Jan and I had driven this car to the New Jersey T-Bird Convention in 2002, and to the Miami Convention in 2004 without any major problems. I also raced this car in October of 2003 and won my class, and then “King of the Hill”. Since the white ’57 ‘Bird motor had a fresh rebuild and was out of the car, swapping motors seemed to be the thing to do. But circumstances with Charles and I required us to leave early with no time to change motors. What’s the worry; it’s only a 9,000 mile round trip. 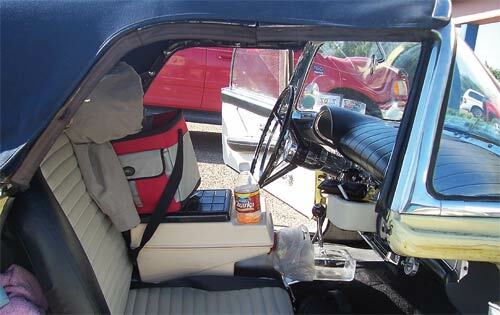 The ’57 T-Bird has the largest trunk of all the classic ‘Birds. Spare parts took priority over clothes. Water pump, fuel pump, starter, ignition parts, hoses, tool kit, hydraulic floor jack, jack stand, jumper cables, electric air pump, and battery booster went in first. A new set of Coker radial tires went on the wire wheels, and after we removed the fender skirts, we were at last ready to go. We left on Friday, August 24, at 2:00 pm, and arrived in Anchorage on Wednesday, August 30, at 5:30 pm. 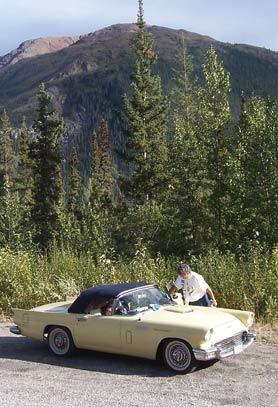 We enjoyed unbelievable scenery through the northern U.S. and Canada. It was almost as if we had planned this trip around the fall foliage, but this was not the case. All the trees and ground cover were green on the trip up, and three weeks later on the way back, it had magically had been transformed to full fall colors. 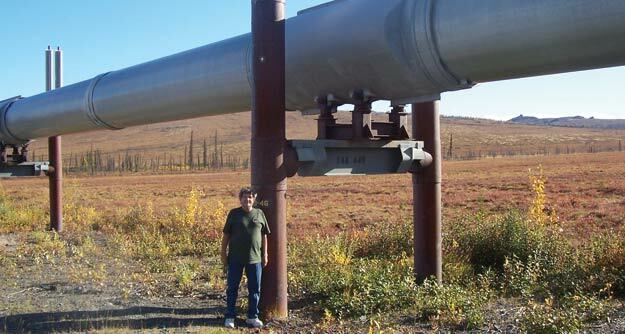 A problem rattle developed in the engine, about 900 miles from Anchorage. Unknown to us, a wrist pin clip or keeper had come off. I decided the problem was on the driver’s side. We stopped at a scenic area for lunch and some engine testing. I removed the valve cover to check and determined the lifters were oiling and working properly. Charles asked what to do, and I replied “no need to worry now, drive it until it stops – then worry, especially if we are 200 miles or more from a tow truck”. We got to Anchorage just fine (and noisy). 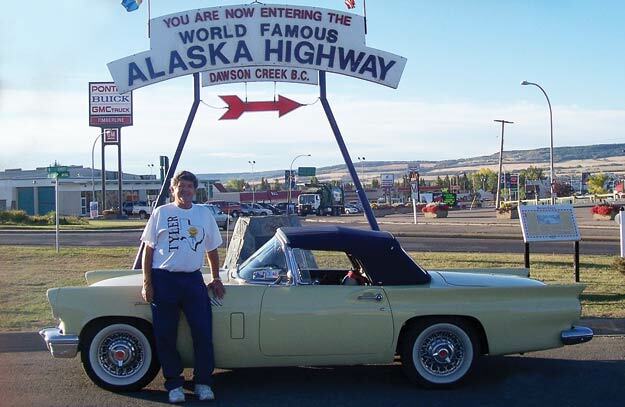 I had been e-mailing Mark Robinson , CTCI (Classic Thunderbird Club International) member in Anchorage, for a couple of years for his opinion of our proposed trip, and called him to get his recommendation of a mechanic. He directed me to Dennis Hackenberger and ADB Machine (Anchorage Drag Bike). They build Harley racing motors for a variety of uses, and had done motor work for Mark on his ’55 T-Bird. I was impressed with Dennis’s knowledge and machine work experience. 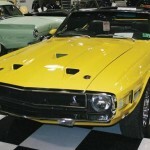 Dennis is a Ford man, and his fair weather every day driver is a ’66 Shelby Mustang. 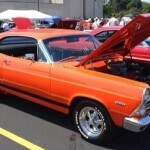 He and his brother Jim both have Model A Fords with flathead engines and Ardun Heads and blowers – and a ’66 Mustang Fastback that runs in the low 9s. I guess that only further qualifies them as Ford guys! Dennis and Jim pulled our motor, and after disassembly, a number of incorrect items were found. I believe the car’s low mileage is accurate, but sometime in the seventeen years before the second owner, some “patch-job” motor work was done. It had no-name pistons, ’65 dates on the bearings, the # 2 piston was different from the other seven, and the wrist pin bearings were different lengths. How about driving 900 miles with a cracked piston, loose wrist pin, and the piston hitting the head? Y-Blocks are TOUGH! I was confident with Dennis and ADB’s ability to do a good job, and a complete rebuild was decided on. With parts shipping from the lower 48, the rebuild would take a few days, so we rented a Ford Explorer and headed to Fairbanks. 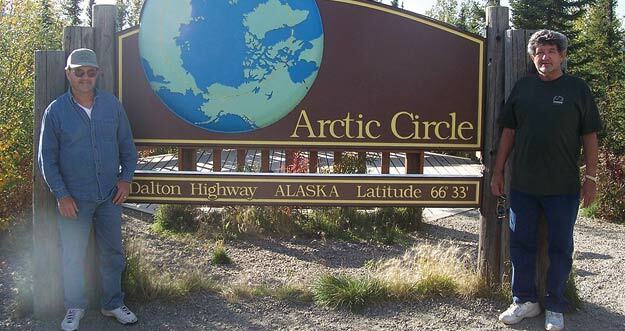 A trip up towards Prudhoe Bay, alongside the Alaska Pipeline for 200 miles, and past the Arctic Circle on a gravel road. 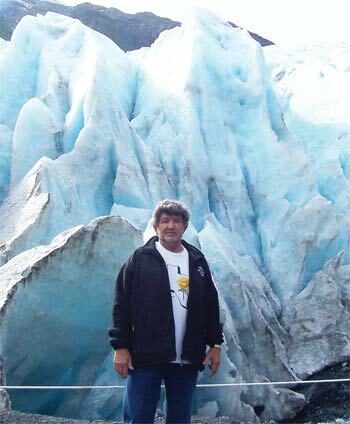 Then, back to Anchorage, a couple of float plane trips to the interior, down to Seward and Whittier, the Kenai Highway toward Homer, and some nostalgia touring in Anchorage. Then we got the call that the car was ready! Dennis and Jim Hackenberger of ADB Machine, Anchorage. We picked the ‘Bird up Sunday afternoon about 6:00 pm, and it ran great. Dennis, Jim, and ADB Machine had done a super job. Dennis advised us to drive the car the next day around Anchorage before leaving for the long drive home, but we were anxious to start back. After a short drive, the decision was made to leave NOW! Packing the car was a challenge with added souvenirs for twenty five adults and children, and the undamaged cylinder head from the engine repair. Surprise, surprise, everything fit. If an event for car loading is ever added to CTCI, Charles and I will be serious competitors. 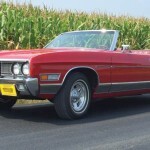 The proper rpms were driven for break-in, and 200 miles later, we stopped for the night. The next morning we intended to change the break-in oil, but no mechanics were available, as it seems that moose hunting season had just opened. We got it done ourselves, and the ‘Bird was Southbound. The drive home was marginally uneventful – except for a herd of 40 buffalo bedded down in the middle of the road just over a hill, encountered at 4:30 in the morning. 4200 miles and five days later, we were back in Tyler, Texas, with the trip of a lifetime to remember. Mark Robinson was the difference between a good trip and a disaster. Without his recommendation, the repairs could have gone bad. My advice for trips: always take your CTCI directory. And remember: these cars were made to drive, so get out there and drive them!